Casa Maya Playamar is a wonderful Villa/Condo, newly decorated with local flavor. It is located in a calm environment, a gated community, ideal for family or anyone wishing a comfortable and restful vacation. Our 2 story Villa features 2 large bedrooms each with their private en suite bathrooms on the second floor, as well a,boudoir with a Murphy bed and full bathroom on the first floor. The kitchen is fully equipped plus all the modern amenities. There are 2 private terraces – one nearby the master bedroom and the other, off the living room – both opening on the backyard and wooded area where you can hear and see beautiful tropical birds, littles animals as koaties, sereques, and sometimes monkeys. In the front, the condo has direct access to the garden, the pool and the palapa. The pool is 20 feet (6 meters) of the house, with direct view from the kitchen window, allowing to keep an eye on children. It can accommodate 6-8 people. Our beautiful site is located in the tranquility of Playacar Phase II and surrounded by a golf course and an aviary named Xaman-Ha. It is a 8 minute walk from the 5th avenue (Commercial Street with multiple restaurants and shops) in the vibrant city of Playa del Carmen. It is located opposite Cozumel Island, on Riviera Maya, in the Yucatan Peninsula, in a 50 minute driving range by car from Cancun. It is also a 5 minute walk from the beautiful white sand beaches of the Caribbean Sea. Being located on the south side of Playacar, it is an easy drive to Puerto Aventuras to see Dolphins, to Akumal to swim with Turtles, to Tulum, the Mayand pyramids and many other places. However, a car is not necessary; there is a bus system for any destination. Open concept living and dining area with sunken living room, flat screen television and DVD player. Terrace nearby the living room with table and chairs, long chairs, awning and gas BBQ Weber. Closed boudoir: Queen Size Murphy bed and sitting area, computer table and reading area. Kitchen: Recently fully equipped including range, fridge, blender, regular and espresso coffee makers, microwave, water dispenser, etc. Laundry room: Washer & dryer, drying rack. Full bathroom with shower next to the boudoir. Master bedroom: King size bed, chair, en suite bathroom with separate shower and large tub; terrace with 2 armchairs and a small table. Guest bedroom: 2 Queen beds and a chair with en suite bathroom. Children furnitures as plastic bath, booster, playpen, gate, security jackets and aquatic toys. Greeting by Property Managers in 2 languages (English, Spanish) who may also organize your transportation from the airport and/or your activities. Binder in the villa including everything you need to know to facilitate your stay. If you are more than 8 people and want to rent a 2nd house, we can accommodate you with a neighbor rental. We are a retired couple leaving in Quebec, Canada. We travelled in many countries around the world before falling in love with Mexico and Playa del Carmen. We enjoy our retirement, having good time with friends and family, particularly our two grandsons. We have the privilege to spend three to four months a year in our comfortable villa. For the rest of the year, it is our pleasure to open our house to guests all around the world. We are speaking French, English and Spanish. We chose the house because it is at walking distance to everything: beaches, golf courts, diving and all the accommodations of Playa del Carmen. 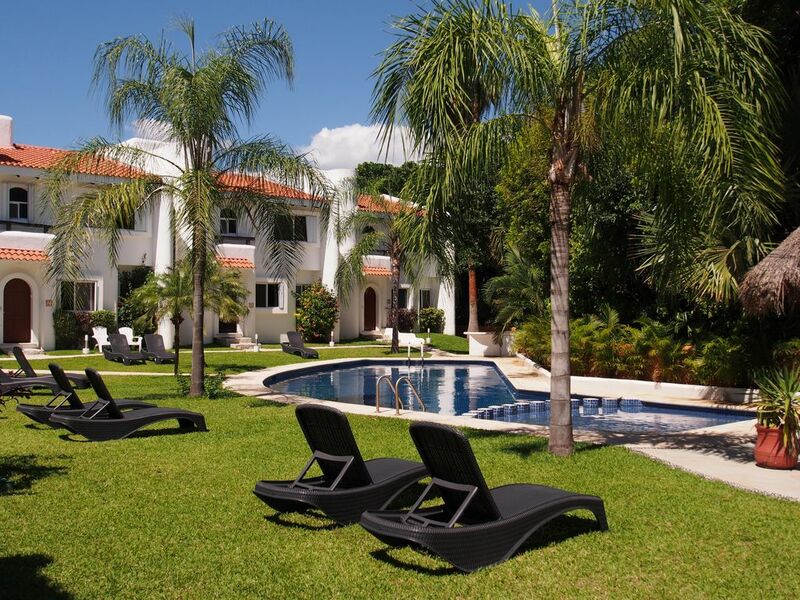 It is located in a quiet and safe environment but close to the vibrant life of Playa del Carmen. We are part of a 16 houses site, quiet place, ideal for couple or families. We pretend to have one of the best spot, in front of the pool and with a private terrace in the back facing the jungle. We have a safe and clean environment with all the commodities. The house is very well equiped, newly decorated with a mexican flavor. We have very good house managers taking good care of our guests and available anytime. New big size refrigerator & freezer LG. Electric coffee machine and Expresso machine. Including spices, condiments, blender, bottled water, electric tea kettle, salad spinner, thermal beach cooler bags. With view on the pool. Completely equipped. Catering available. In the master bedroom (second floor). View of the backyard and trees. Lot of birds. Accessible anytime, with long beach chairs and a palapa. It is possible to organize for you the service of a chief for your meals. Also, transportation service and tours. Anything that you need! Great condo for a good price. Nice and secluded at night so no noise. We felt absolutely safe inside Playacar. Pool was nice to cool off in after a day of diving or just getting around Playa. Well stocked if you prefer to cook a meal or only a 20 min walk to the restaurants on 5th. I would definitely stay here again. Thanks Jim for the review. You are definitively welcome to come back. Hi Rodney, Thank you for your comments and feedback! It is great to know that overall you enjoyed your stay at Casa Maya Playamar. We are sorry to hear that you were disappointed with the house. Grading standards here in Mexico are quite different than in the US or Canada. Our kitchen appliances are new and modern and work perfectly. The photos on the website reflect exactly what we offer and our prices are more than competitive considering you booked the busiest and most expensive week of the year. We had a wonderful experience with our family (2 parents and 2 young adults). The location was excellent, close to everything (15 minutes walking to the 5th avenue with restaurants, stores, etc). However, you could chose to stay by the pool and relax or go to the beach (15 minutes walk as well). The house was very comfortable for 4 adults and very clean as well. Gisèle was quick to answer your mails if you had any questions. However, a helpful binder in the house was available for you to get acquainted with the house and the area. I would recommend it without hesitation. This is a beautiful villa overlooking the pool at the front and a quiet, private patio at the back and we have had a very comfortable stay. It is just a short walk to the shops, restaurants and bars. We had a great time, and I will come back again. Playacar is a residential quarter of Playa del Carmen, very quiet, surrounding the golf, protected by barriers and security guards(gated community), and at 5 minutes from the beach and downtown. - Lower rates for longer stay. - Preferential rates for last-minute opportunities.